A number of fires broke out over a Louisiana parish last month and is apparently aimed in the direction of Black churches. An investigation into the criminalities has been instituted, and it appears that the fires could be related. The fires started in the rural community of St. Landry Parish, north of Lafayette Louisiana’s, on March 26. The cause of the fires has yet to be determined with the possibility of arson or that the three incidents were all related, has the community worried. No deaths or injuries have been reported in either of the fires; however, there is widespread impairments to the Greater Union Baptist Church in the city of Opelousas, the Mount Pleasant Baptist Church, and the St. Mary Baptist Church in Port Barre. Rev. Gerald Toussaint, the pastor of 140 year old Mt. Pleasant Baptist, questioned the motive of the person or persons involved in the fire that destroyed their church. The fire at Greater Union Baptist Tuesday burned from the roof to the pews. For Pastor Harry Richard, whose grandfather helped start the church more than 100 years ago, the damage is personal. “He left a legacy for me and I was trying to fulfill that to the best of my ability,” he said. Officials say a fourth others was “intentionally set” on March 31 at a predominately white church, the Vivian United Pentecostal Church, about four hours north of the other fires in Caddo Parish. The number of hate crimes in the United States increased 17 percent in 2017, the third consecutive year that the attacks rose, according to FBI data released last fall. These fires reverberate parallel to episodes when the burning of Black churches was used as a fear tactic during the civil rights era. Public outbreaks of lynching, bombings, and burnings of crosses and churches and other forms of violence, were used to scare the Black community in hopes of Black people not standing up for themselves. 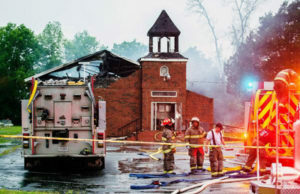 “We can’t let this setback stop us from doing what God initially called us to do,” said Kyle Sylvester, the pastor of St. Mary’s Baptist Church, the first that was burned. The ATF and FBI have joined the investigation team.